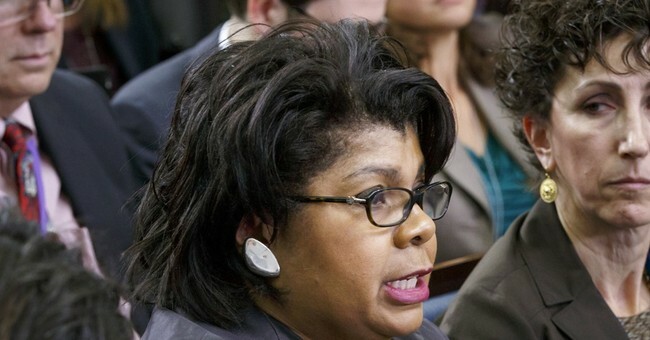 April Ryan, a CNN contributor and reporter for American Urban Radio, sparred with White House Press Secretary Sarah Huckabee Sanders Thursday over President Trump’s $130,00 reimbursement to his personal lawyer Michael Cohen for a payment to Stormy Daniels, who alleges a sexual encounter with Trump. Ryan later commented on CNN that Sanders was “very street” in her reaction to the questioning. Ryan pressed Sanders on finding out about the reimbursement when Trump lawyer Rudy Giuiani revealed it on Fox Wednesday. The White House has previously said they were unaware of such a payment. "The White House press office wouldn’t coordinate with the president’s outside legal team on legal strategy," Sanders told Ryan Thursday. "You said yourself you were blindsided," Ryan pressed. "Well, I said it. But you were blindsided from what you said." "With all due respect, you actually don’t know much about me in terms of what I feel and what I don’t," Sanders said. "I think we’re done." "It was a moment. She took this personally and it was not a personal attack," Ryan said on CNN following the exchange. "She admitted at that podium just moments ago and I'm sure she's watching in her office, 'Hi, Sarah,' that she literally said at that podium that she heard Rudy Giuliani while we heard it." "She was watching, she found out all of the information while she was watching Fox last night,” Ryan emphasized. “So she was blindsided. This was not a personal attack on her. And for her to say something like, 'You don't know me' — that was very street." "I know there are street politics here but that was very street,” she emphasized. She also accused Sanders of using a stock photo of a pie in a Thanksgiving tweet, an accusation Sanders graciously responded to by baking Ryan a pie at a White House Christmas party.